IN THEORY, the world has too much carbon dioxide. In 2015 the Paris climate agreement set limits on emissions of the gas to prevent global temperatures rising by more than two degrees Celsius above those of pre-industrial times. But in practice, makers of food and drink in Europe have found that they cannot find enough of the gas. And this unlikely shortage is likely to get worse in future. Food-grade CO2 is a vital ingredient: it puts the fizz in carbonated drinks and beer, knocks out animals before slaughter and, as one of the gases inside packaging, delays meat and salad from going off. A shortage of the stuff has therefore created havoc in foodmakers’ supply chains. Heineken, a Dutch brewer, and Coca-Cola, an American drinks giant, have been forced to close some of their European plants. JD Wetherspoon, a British pub chain, ran out of some beers. Scotland’s largest pig slaughterhouse was forced to shut. On June 29th Warburtons, a British baker, said that the problem had affected crumpets, closing down half its production of the snacks (the affected bakeries have since reopened). Increased demand for food and drink due to the World Cup and sunny weather in northern Europe is only half the story, says Ned Hammond of Berenberg, a bank. Unlike America, which gets most of its carbon dioxide from natural wells, 50% of Europe’s comes as a by-product of ammonia production; a further 30% stems from processes for making hydrogen and bioethanol. Those sources of supply tend to be seasonal. For instance, three out of Britain’s five ammonia plants have been closed for maintenance—mostly for economic reasons. Farmers are cutting back on fertiliser use in the summer months, putting pressure on prices. 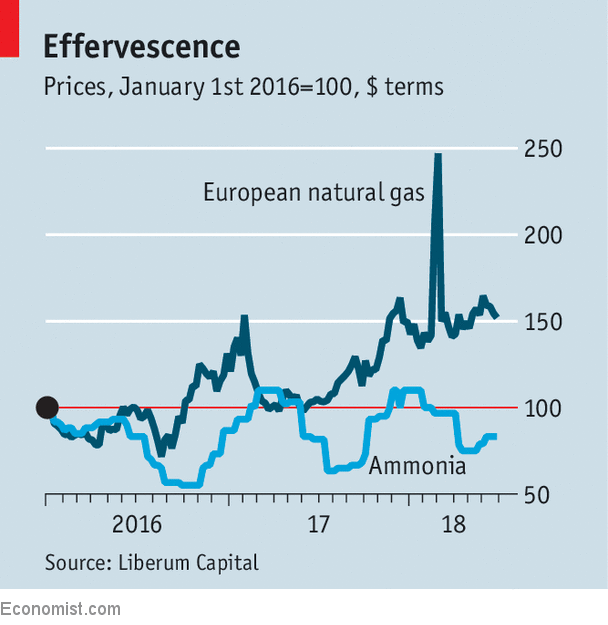 And high prices for the natural gas from which ammonia is made have squeezed margins. For most commodities, prices would then rise, encouraging more production. But the carbon-dioxide market does not work like that, explains Adam Collins of Liberum, another bank. First, there is no spot price that could adjust quickly; most of the gas is sold through long-term contracts. Second, since the gas is a cheap by-product of making ammonia and other chemicals, it is not worth making them simply to produce CO2. In 2016 global carbon-dioxide sales were worth just over $2bn—minuscule amounts compared with $49bn-worth of ammonia sales. And third, shipping the gas costs so much compared with its price that it is not worth moving supplies from America or Asia to Europe. The biggest suppliers of CO2—Praxair, Linde, Messer and Air Liquide—hope that the shortage will soon end as ammonia plants restart and as the firms move stocks from other parts of Europe. But users of the gas are not so sure. There was also a shortage in 2015, says Brigid Simmonds of the British Beer and Pub Association, a trade body. And the situation each summer appears to be getting worse. Demand for carbon dioxide in Europe is rising several times faster than ammonia production, which is gradually shifting to other continents with cheaper sources of natural gas. Co-ordinating plant shutdowns better could help in the short term. But squeezed margins could mean more, not less, downtime in the future. Other sources of CO2 could be explored. Bioethanol production could be expanded in Europe, but that would need subsidies. The emissions of power stations could be captured and “scrubbed”, separating the CO2 from other exhaust gases. Producing food-grade CO2 in this way is not price-competitive with existing sources, says Ralf Gubler of IHS Markit, a research firm. But a carbon tax could make such carbon capture and storage technologies commercially viable. Such a policy would be environmentally friendly. It could save the food and drink industry’s bacon each summer, too.